"BGO Vegas is the slots arm of BGO Entertainment Group, offering a multiple software-powered slots library." BGO was a bingo exclusive gaming site when it was first launched in 2012, but it has come a long way in the past couple of years. Nowadays BGO is a recognizable, trustworthy and innovative online gambling brand offering bingo, sports betting, online casino, Macau live casino, mobile gaming and betting as well as an exclusive slot gaming department called Vegas. BGO Vegas features over 250 slots created by a number of software providers such as Microgaming, NetEnt and BGO Entertainment among others and they offer an enjoyable and thrilling gaming experience. BGO Vegas also offers bonuses and promotions to both new and loyal players and it has a reliable customer support. The site is licensed in Alderney and the UK Gambling Commission. The site gives up to 50 fair spins spins to new players. The way it works is that you will receive 1 fair spin for every £1 deposited up to 50 fair spins. BGO Vegas offers a happy hour promo where you can get 10% cash back up to £50 on all slots. You simply need to deposit £10 to qualify. 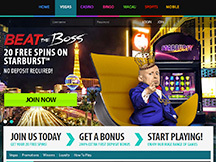 An innovative promotion at this site is the Beat the Boss challenge where you can win free spins on The Boss's Wheel including real cash prizes. Up to 50 Fair Spins 18+. T&C's Apply. As already mentioned, BGO Vegas offers only slot games developed by several providers. There are no table games or video poker; these types of casino games can be played at the Casino sector. Most of the slots are video slots that come with plenty of generous bonus features. Some of them are slots from NetEnt such as Aliens, South Park Reel Chaos, Gonzo’s Quest etc. There are also slots from IGT such as the progressives Cleopatra and Siberian Storm Megajackpots, Da Vinci Diamonds, Golden Goddess and many more. Furthermore, some Microgaming slots include Thunderstruck, Dr. Love, Piggy Riches, Mermaid Millions and so on. Last but not least, there are BGO exclusive slots such as Aladdin and The Wild Genie, Jekyll and Hyde and Jungle Trouble. A couple of deposit and/or cashout methods available at BGO Vegas are Visa, MasterCard, Maestro, PayPal and Ukash. Each method comes with its own min and max transaction limits and pending time. All deposit transactions are immediately processed, while the pending time for cashouts in within 24 hours. BGO Vegas gives a certain number of points to players that play slots on regular basis. As they play, players gather more and more points and this also increases their member status. VIPs can join the unique bVIP Club comprised of five levels and get bigger playing limits, special VIP promotions and bonuses etc. If you want to try out the best and exclusive video slots on the web, BGO Vegas is the right online gaming destination. Here you can try out slots from various providers including some in-house developed titles. The games also come with many bonuses and winning opportunities as well as high quality visuals. Are you ready to play at BGO Vegas? Need to find a good casino quickly? Use our summary table to locate the perfect casino for you in just a matter of seconds.